Over the past couple of years the River Nene has produced some outstanding sport for those anglers prepared to put the time in. Unfortunately these last few weeks of autumn have not been anywhere near as good as we could have hoped for. As we all know the Nene is now in the top list of rivers across the county that suffers from massive water abstraction. That’s not a criticism, just a fact of life - we all need water with anglers at the bottom of the chain. Take my word for it, it really does affect the fishing. A low, clear river with very little flow at all is a recipe for a difficult time. Add a stiff downstream breeze and bright sunlight and it was a wonder much was caught at all in the weekend’s big practice match for the East Midlands Winter League opener this coming Sunday. Top rod with a modest 9lb 2oz was Huntingdon-based Steve Welford. The Browning Hotrods angler drew Orton Downstream and had a mixed bag but caught a lot of perch on a chopped worm line. Runner-up with 9lb 1oz was Josh Pace, whose catch included a good tench. So what can anglers expect this Sunday? I am afraid to say it’s going to be much the same with small fish nets the order of the day. Hopefully a few better fish will show and a few more perch weights will be recorded but on the whole 5lb looks a good weight. 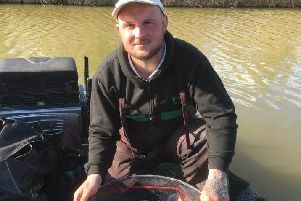 Ramsey AS fished their club match at the weekend on the fenland drain at Exhibition Bridge. The pegs above the bridge were used which saw Adrian Wilding top the field with a very respectable 12lb of small fish, all taken on a slider float, a forgotten art for many. Runner-up was Paul Kilby, who had another small fish catch weighing 11lb 1½oz caught on the pole. In third place with 4lb 1oz was Ray Myring. The Horseshoe Pool at Float Fish Farm Fishery was the venue for the Webb’s AC anglers which saw the early pegs producing a head-to-head battle between Dave Marzell and Neil Bourne. At the final whistle Marzell had a comfortable victory taking 93lb 8oz on the pole with paste. I don’t often wax lyrical about runners-up. As a rule few remember for long who comes second, but I have to give a special mention to Neil Bourne. For those that don’t know Bourne, he has only been match fishing a couple of years and I am sure he will not mind me saying he suffers from a disabilitating disease which dramatically impairs his control of a rod or pole. To take the runner-up spot with 63lb 12oz is a wonderful achievement so well done Neil. In third place with 56lb 1oz was Mick Linnell.